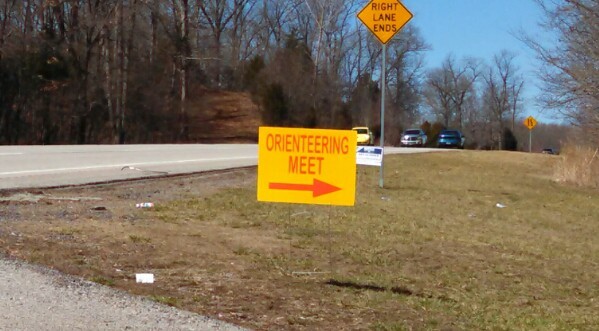 It’s not that there aren’t backpackers and outdoor adventurers in rural Kentucky; there are. But, I rarely seem to meet any of them, and, as a result, I generally don’t talk much about my outdoor experiences and aspirations. There are plenty of other things to talk about, and I genuinely enjoy visiting with friends and neighbors in the Bluegrass State. However, one of my favorite things about taking a Wilderness First Responder course at the Outward Bound campus of Table Rock, NC, is being surrounded by dozens of other wanderers and outdoor adventurers. While we share the passion of adventuring outdoors, the specific sports and activities that we each enjoy are varied. I am one of a few people in our class who primarily consider themselves to be backpackers, and there are rock climbers and skiers and snowboarders and white water athletes and flat water boaters and hunters and horse packers in our group. There are instructors and group leaders; there are people who generally enter the backcountry with others and people who generally adventure alone. All of this has contributed to some varied perspectives and biases in how we have assessed and reacted to staged scenarios of disasters in the wilderness. I came to Table Rock to take a Landmark Learning Wilderness First Responder course, which is a prerequisite for the outdoor leadership program I was just accepted to in Greenfield, MA. A WFR course is 80 hours and involves both lectures and laboratory time, during which instructors watch as we treat mock patients taking part in contrived scenarios. 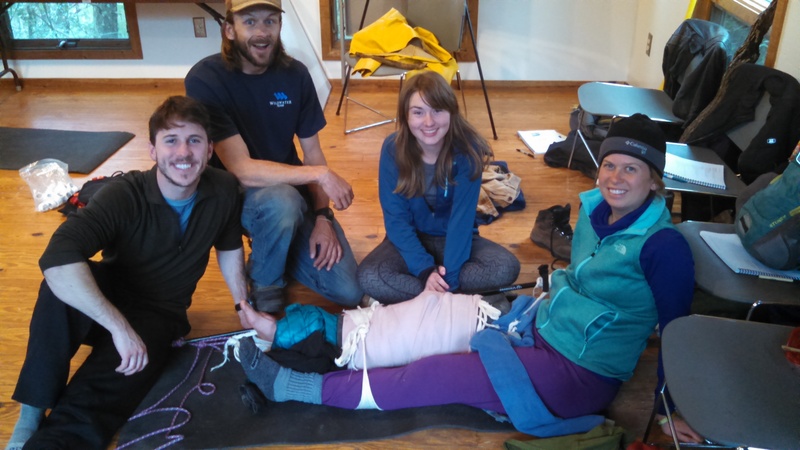 In the last few days, I’ve treated an asthmatic rock climber, a hypothermic naturalist, an unresponsive hiker, an adventurer suffering from altitude sickness, and a pogo stick champion with a broken wrist. I’ve been a birder with hypertension, an avid paintballer with a broken rib, and a Gore-tex-sponsored competitive runner suffering from heat stroke. Acting in the role of rescuer, I’ve been a lead responder, a member of medical teams, a patient advocate, and part of a volunteer response crew. And, in study sessions, some new friends and I have reenacted some of my favorite stories of health-related misadventures on the Appalachian Trail, including the tale of the Barrington Crater. I’d be lying if I said that I haven’t been having fun. However, there is also a real gravity to the WFR course. Every day, we learn about the traumatic injuries, environmental threats, and medical issues that can affect us and those we love while we’re doing the things we love to do. We hear recounts of tragedies, and we evaluate stories of successes and failures of medicine in the field. We acknowledge the limits of our abilities and consider the ways in which we can make a difference. 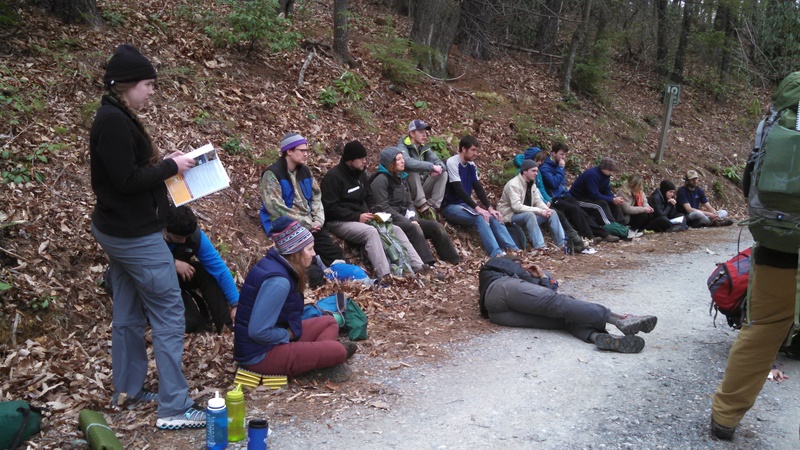 The responsibility of becoming a/the person who, among a random group of thru-hikers, should know what to do in a given situation is something I’ve continued to think about throughout the course. Maybe it’s my love of method acting catching up to me, or maybe it’s the memory of Emma’s fall on Mount Washington last year, but I have a difficult time distancing myself emotionally from some of the material I’ve been learning. It’s not that I’d felt invincible in the outdoors, but I have felt safe, secure in my experience and physical ability. While increased awareness of what can go wrong might make me a bit more anxious about scaling a wet and rocky incline alone, I think the knowledge and ability to respond to an emergency situation also engenders a sense of confidence that puts some of those worries to rest. As our instructors love to say, “Prevention trumps medicine.” Let’s mitigate the risks that can be mitigated and know how to respond to the problems that may occur. Long story short, if you’ll also be thru-hiking the PCT this year, do everything you can to avoid dehydration, heat exhaustion, hyponatremia, rattlesnake bites, and traumatic injuries. But, if a problem does arise, I think you’ll be in good hands if you happen to have said problem around me or another WFR. Be safe out there, friends. Since I am currently stuck in bed and far too sick and sleepy to compose a coherent sentence, let alone a coherent blog post, I thought that I’d share the text of a speech I gave a couple weeks ago at a local Methodist church. Henry David Thoreau, arguably the most famous hiker and naturalist, once declared, “In wilderness is the preservation of the world.” The various truths that can be extrapolated from this quote were nowhere more evident to me than when I was atop Mount Katahdin, which, incidentally, Thoreau had climbed as well. 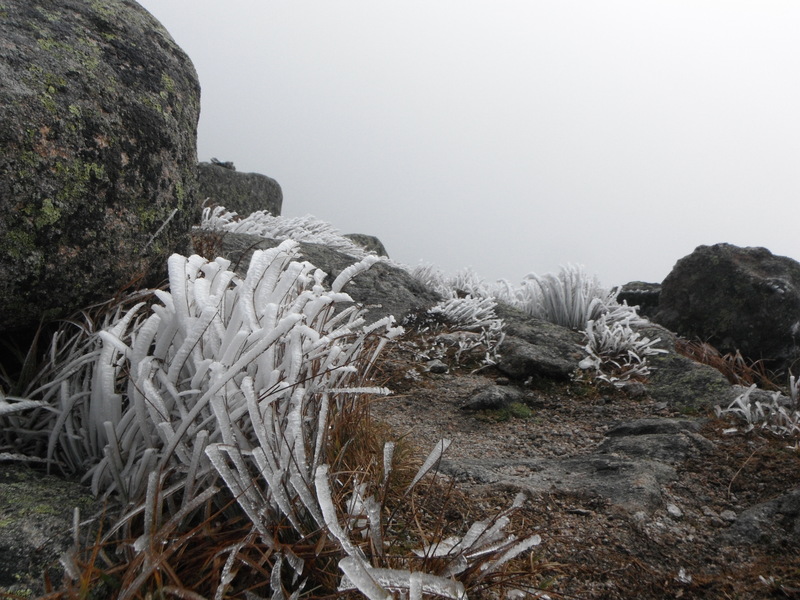 During my own climb of Katahdin, I, too, was awestruck by the wildness of my surroundings. Located hundreds of miles north of the Maine-New Hampshire border, Mount Katahdin has seen snow every month of the year. A monadnock, it rises, alone, far above the surrounding landscape. Its treeline is crossed before a hiker begins her ascent in earnest, and, from there, the rest of the climb is a steep scramble over boulders. The steepest portion of the ascent is from treeline to the aptly named Tableland, but one’s hike is by no means over after she’s climbed onto the Tableland. From there, it’s another mile to the summit, a mile during which one is, inevitably, nearly knocked over by gale-force winds onto the rime-ice-covered rocks and alpine plants that comprise the treadway. 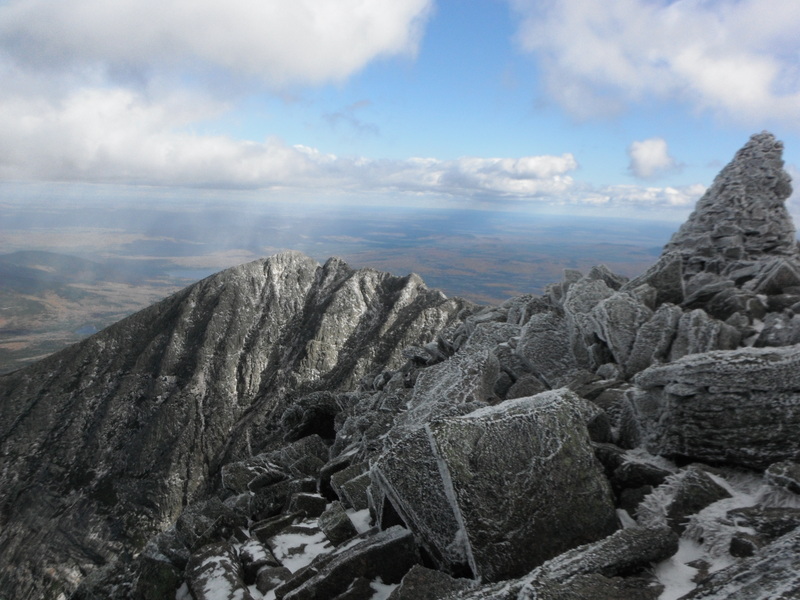 The climb up Katahdin is, indisputably, the hardest climb on the Appalachian Trail. (And, that’s saying something; in the White Mountains, the climbs up Moosilauke and Wildcat are so steep that a misstep is certain to have dire consequences.) 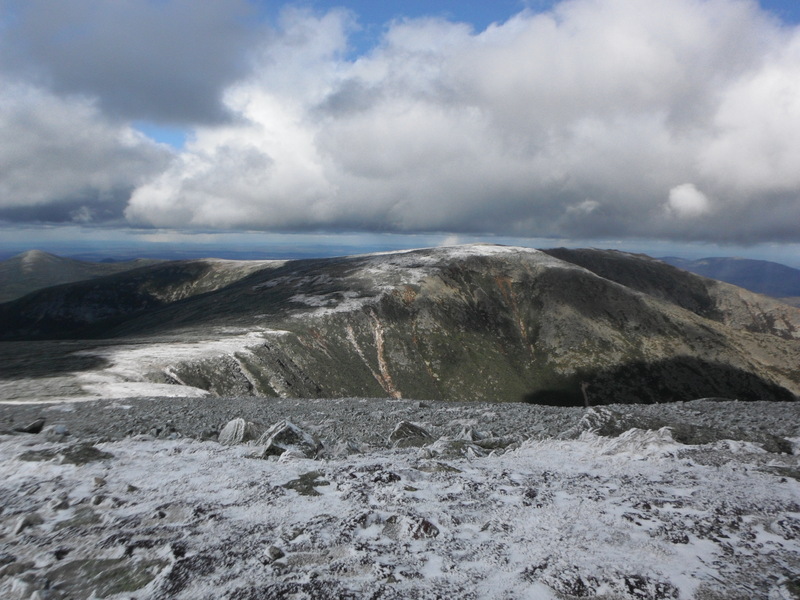 But, as challenging as the climb up Katahdin is, most thru-hikers barely notice it. Instead, as I was, they’re likely lost somewhere between being entirely present to deal with the task at hand and in a reverie. For my part, my reverie began with memories of the days when I was learning to love hiking, when I spent a summer in the White Mountains of New Hampshire as part of a Research Experience for Undergraduates affiliated with the National Science Foundation. Thirteen aspiring young scientists and I lived in a little farmhouse in the middle of the woods, and, while we spent all week hiking for our research, we found nothing to do on the weekends except to hike some more. And I loved every minute of it. My reverie continued as I thought about what the Appalachian Trail meant to me, about the big questions I set out on a 2200-mile hike to answer and the answers I’d come up with. I thought about how the trail had seen me come of age, so to speak, and become, to quote Broadway’s The Secret Garden, “the girl I mean to be.” Perhaps most of all, on my second climb up Katahdin last September, my thoughts centered on my battle with Lyme Disease, on the ten months I spent in bed and on doctors’ visits and ambulance rides and panic attacks and relapses and abdominal surgery and lots of medicine…and my eventual recovery. I thought about how, just a few months earlier, after surgery in May, I was so proud to walk down my family’s driveway in June. I was even prouder to go for walks on the road in July, thrilled to begin hiking again in August, and ecstatic to shoulder my pack and set off into the Maine woods in September. 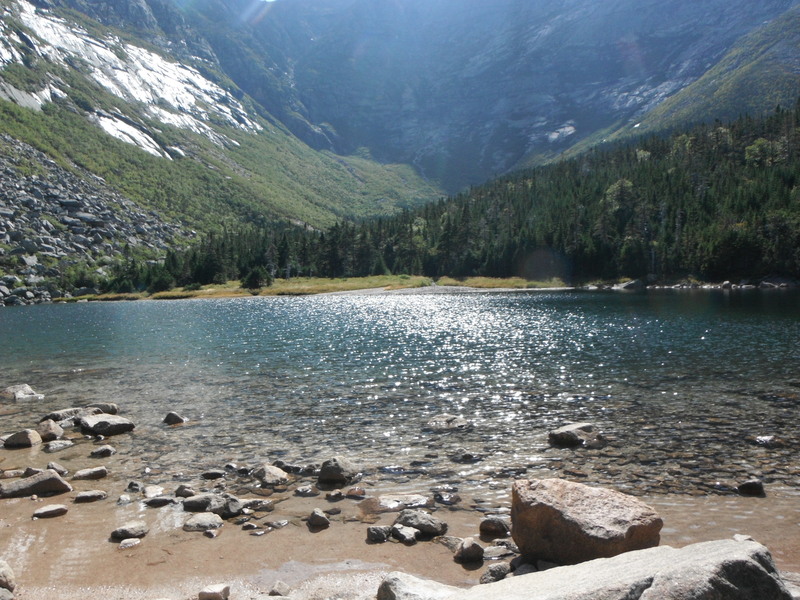 It was these recollections that brought hot tears to my eyes as I neared the wooden sign atop Katahdin, tears that I quickly wiped away for fear they’d freeze—until they came too quickly that my efforts were pointless. I took the summit photo of another Appalachian Trail thru-hiker, whose trail name was Not Worthy. My sentiments exactly. 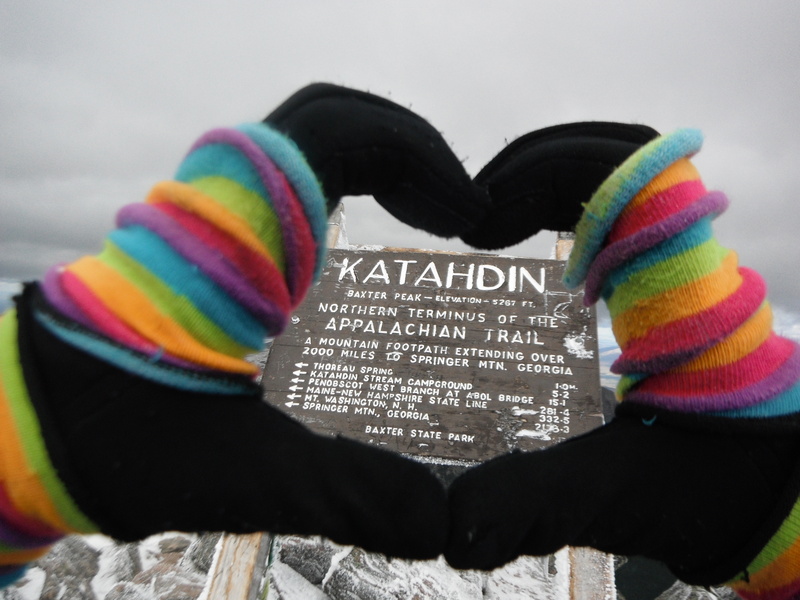 Katahdin makes a great many “thru-hikers”—hikers who walk the entire length of the Appalachian Trail (which stretches from Georgia to Maine) in a year—feel not worthy. 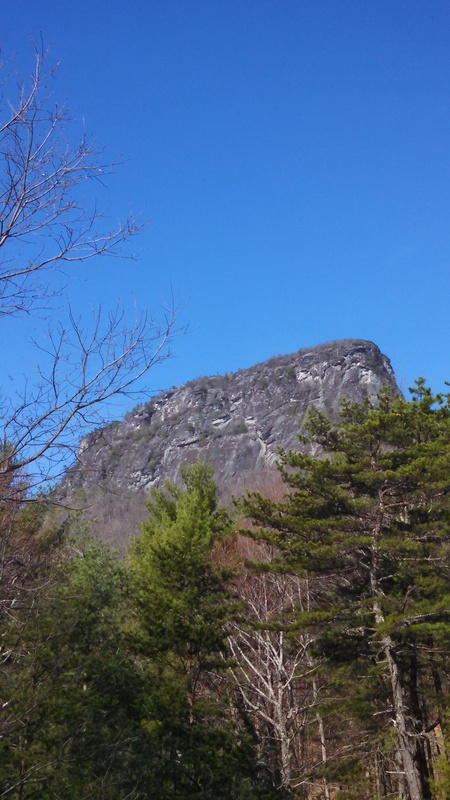 The mountain serves as the northern terminus for the AT, and, as a result, serves as a receptacle for hikers’ hopes and dreams as they make their northward journeys. Sometimes, the enormity of the task of walking a couple thousand miles forces us to take it a day at a time, particularly when we’re trudging through snow in the Smokies, wading down a rain-drenched trail for the fifth day in a row, being eaten alive by mosquitoes, or being burnt to crisps atop Pennsylvania ridges. But, sometimes, on crystal clear nights, when we’re camped atop ledges and looking heavenward, we let ourselves imagine reaching the monolith in Maine that marks the end of our journey. How, exactly, can one end what for many has been a life-changing journey? Generally, hikers come out to the trail at a transition time in life, between, say, high school and college, college and career, family and empty nest, or career and retirement. Setting out on the trail often means giving up an apartment or even selling a home. It means paying off bills and getting rid of unnecessary possessions. It means quitting a job. It means saying goodbye, at least temporarily to loved ones and patterns of living. And, thus, the logistics alone of getting off trail pose challenges. But, most hikers agree that the far more challenging aspect of ending a thru-hike is emotional and mental. 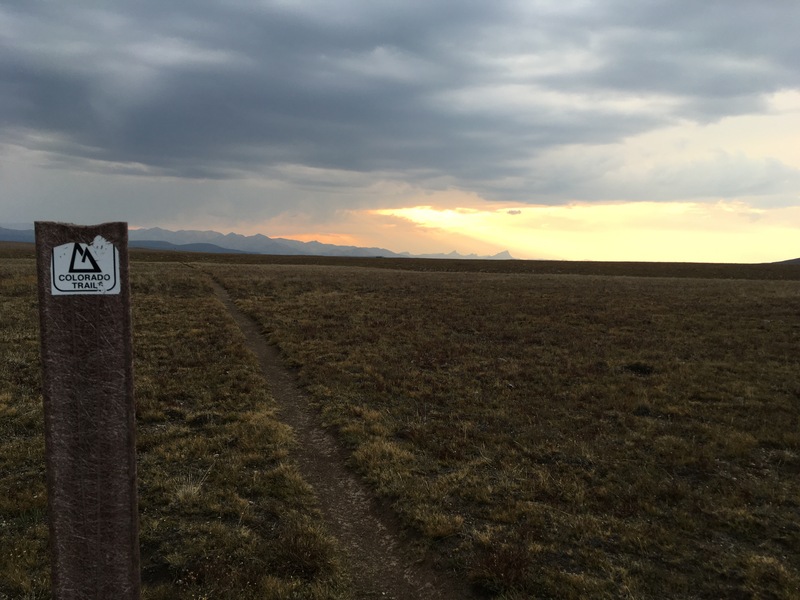 It is difficult to describe the spiritual connection many hikers feel with the trail; I find it difficult to describe my own experience, as so many of my feelings are contradictory and counterintuitive. Crossing mountain creeks and standing atop the eastern peaks with nothing but what I carried on my back made me feel both infinite and infinitesimal, remarkably powerful and remarkably powerless, and completely independent and connected to something greater than myself. It’s only fair to point out that backpacking 15-25 miles every day seems to tinker with hikers’ brain chemistry. I’ve talked at length with many backpackers—male and female, young and old alike—who all describe heightened emotional experiences in the wilderness. The highs I experienced on the trail were the highest of my life; similarly, the lows I felt were unparalleled. 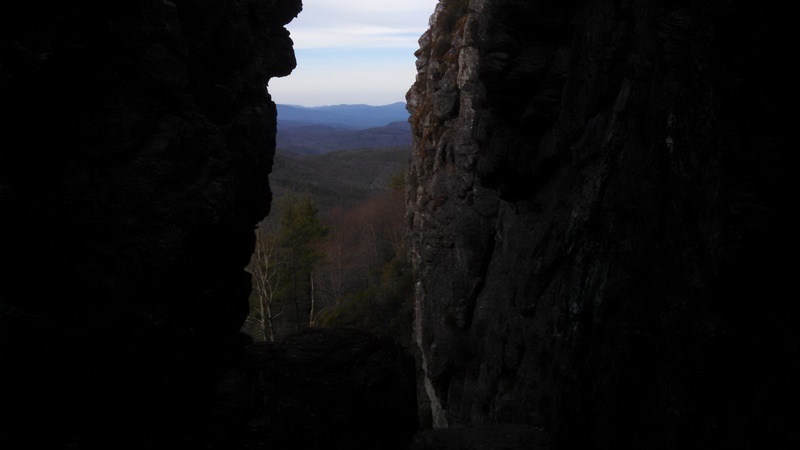 On the AT, I was miserably sad, crippling lonely, and euphorically happy. Perhaps it is the endorphins of hours and hours of exercise every day…or the hunger…or the tiredness. Or perhaps it’s something more. In the wilderness, life is simple. Days consist of walking, eating, and sleeping—and walking, eating, and sleeping some more. When all of your belongings have to be carried on your back, you’re likely to have few possessions, many of which serve several functions and all of which are as light as they possibly can be. It’s almost as though the trail forces hikers to exist at the base levels of Maslow’s Hierarchy of Needs—we’re concerned with our physiological needs and, perhaps, with basic social needs such as safety and community. Complimenting this simplicity is a deepening of interpersonal interactions. They say that the trail dissolves friendships made at home, while friendships forged on the trail endure the test of time. I’ve found this to be true in my own life, as hiking nearly disintegrated the friendship I had with a college buddy who’d accompanied me on part of my first foray on the Appalachian Trail in 2011, whereas a hiking partner I found on trail for part of my thru-hike remains a very close friend. On trail, there’s virtually none of the schmoozing and one-upsmanship that seem far too common in interactions in civilization. It’s not about what job you held or what car you drove or what organizations you’re part of or where you went to school or how talented your spouse is or how successful your children are. There’s no need for any of that when everyone is wearing the same filthy synthetic T-shirt he or she has worn since Georgia, and there’s no time for it when there are miles to be hiked, dinner to be cooked, and water to be gathered. We say that the trail may be long, but it is very narrow. Time and again, when I’m hiking in the eastern woods, I run into other hikers that I know. Atop a peak in Massachusetts a few summers ago, I ran into the first hiker that I’d met; in Maine last summer, I had lunch with a fellow 2012 thru-hiker I’d stayed at a shelter with; a few weekends ago, I hiked in North Carolina and ran into the guy who had taken my summit picture atop Katahdin. And, whenever we meet again, like old friends, we pick up where we left off. It’s not just the other hikers who add to the sense of community on the trail. Perhaps even more important to the cultivation of the spiritual connection to the trail that many hikers describe are people we call trail angels. A trail angel is simply a generous human being who is kind to hikers. Trail angels, and the “trail magic” they provide, can take many different forms. A trail angel might offer up his backyard for hikers wishing to camp in a trailside town while resupplying, or she might shuttle hikers to and from the trail, if a road crossing the Appalachian Trail is too quiet or too dangerous to facilitate thumbing a ride. Trail magic might be a cooler full of brownies or tomatoes left in the middle of the woods, a pack loaned to a thru-hiker after the shoulder strap of his gave out, or a trailside barbeque. The most memorable trail magic I had the privilege to receive came to me in Massachusetts. At that point, I’d hiked 1500 miles through sun and rain and snow and hail, climbed over Everett and Race (two mountains marking the end of the mid-Atlantic and the return to actual mountains), came down to a road crossing, stepped onto the road, and promptly tripped over a branch and fell. Now, I generally don’t think of myself as a pansy. I spent my teenage years on a farm and have seen my share of animal and human emergencies; I tend to pride myself in keeping my cool in such situations. That wasn’t the case on that summer day in Massachusetts. I sat to examine my knee, from which a sizeable amount of flesh had just been removed—I came to call the resulting area the Barrington Crater, after the town whose road I’d fallen on—and realized that the liquid running down my bent leg and pooling in my shorts was my blood. Instantly, I got incredibly lightheaded and lay backward on the road. At that moment, an SUV came rumbling toward me and quickly pulled to the side of the road. Out jumped Mary Kate, a middle-aged nurse who was on her way home from her shift. Without pause, she rushed to my side and began examining and treating my wound. Once I was bandaged up, she invited me home to her family’s house for a few days to recover. What Mary Kate probably didn’t know was that she gave me a tremendous gift when she helped me on my northward journey. Unitarian Universalists describe a virtue that they call “sacred hospitality,” an altruism and caring for others from a place of love, and any description of that virtue brings to mind the generosity and thoughtfulness of Mary Kate. I know so many hikers who have been on the receiving ends of such kindness—some who have found ways to pass it on and some who are anxious for such opportunities—that I’ve come to think this hospitality is fundamental to the formation of the spiritual and emotional connection most hikers have with the trail. As much as backpacking is an inherently independent endeavor, it also leads to the creation of community. When you’re facing a cold night in Vermont and haven’t received the mail drop containing your winter gear, no one hesitates to offer to let you share their tent; if your water filter has broken, it’s assumed that you’ll be able to tag along with another hiker and use theirs. With its love of independence, the American culture tends to ignore the healing and freeing power of interdependence, and I believe it’s this interdependence that we get to experience when we are more vulnerable, as nomadic travelers. Trail angels and interdependence and an adherence to the principle of reciprocity—if not directly to the giver, then to the community in a larger sense—might be part of the reason that there’s a saying up and down the trail: “The trail will provide.” I think that this was a sense that was born of necessity: It was no use to stress and worry about something hundreds of miles away because other things need to be dealt with immediately; moreover, by the time you’ve walked hundreds of miles, other things are likely to happen that will, seemingly serendipitously, make whatever you were stressing about inconsequential in one way or another. A byproduct of the notion that the trail will take care of its own is a beautiful surrendering to experience, a trusting that all will work out, a profound presence in the here and now, a peace with the way things are. And, this is deeply spiritual. As he was marveling at the beauty of a summer day, Ralph Waldo Emerson once described the globe as a toy, given by God to His human children. Turning on the news or reading a newspaper today, it’s readily apparent that we have broken our toy. We’re warming the planet, killing off entire species, poisoning our water, and blasting the tops off mountains. It seems that we, as a species, have lost our spiritual connection with the Earth. And, this brings us back to Thoreau’s declaration that the wilderness holds the secret to the world’s preservation. In my mind, there are a few ways to think about that quote. Perhaps, in spending more time in—in knowing and understanding—the wilderness, we can come to care for it, to preserve and protect it. Familiarity leads to appreciation and love, and knowing more of the world might well be the best way to preserve it. Or, perhaps, we can think about the great many scientific and medicinal gains that can be made from further study of the natural world. Thus, in the wilderness, we can find means to preserve the lives of those who inhabit the world. Or—and this is my favorite conceptualization of Thoreau’s statement—perhaps we can take the deep ecology approach. Perhaps, in some intrinsic way, we are part of the wilderness, and the wilderness is part of us. I don’t mean this to sound New Agey; I’m just suggesting that time in the wilderness may enable us to be somehow more human. The naturalists of the past have romanticized the natural world, have held it up as something essential for the soul of man, as a way for him to recover that which he loses in the hustle and bustle of daily living. This sounds overly sentimental until you see people actually discover the essentiality of time in the wilderness—and until you discover it for yourself. In our shared cultural heritage, we have a recurring theme of clarity gained in nature. Moses climbs a mountain, sees the face of God, and is forever changed. Buddha experiences enlightenment beside a river. In Disney’s The Lion King, Rafiki gives Simba an important lesson under the stars, and Pocahontas seeks guidance in the presence of a willow tree. Furthermore, Heidi grows strong in the Alps, and Mary Lennox and Colin Craven are emotionally and physically healed in their secret garden. I think of these moments of peace and lucidity as mountaintop moments. From the top of a mountain, the thin air enables the stars to appear brighter and the sky to appear bluer. Similarly, “getting away from it all” in the wilderness allows our thoughts and actions to come into better focus, to be seen with greater detail. The key, it seems, is to hold tight to mountaintop moments and create some of our own when we return to the valley, so to speak. In this way, we might regain our spiritual connection with the rest of God’s Creation, might act as the faithful Stewards of Earth that we ought to be, and might, in protecting and nurturing the wilderness inside us, aid in the preservation of the world.